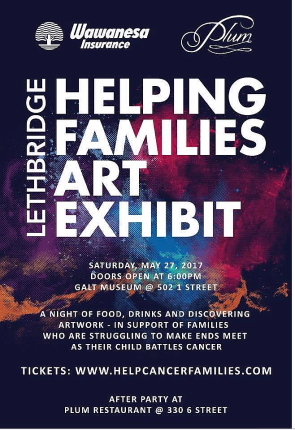 Helping Families will help between 11 to 23 Lethbridge families deal with the costs of cancer treatment thanks to a successful art show fundraiser at the Galt Museum, May 27. 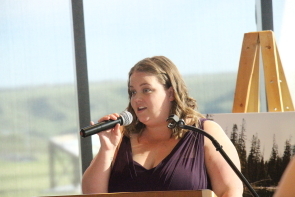 “We raised $17,700 which surpass ed our goal of $17,500,” enthused Helping Families organizer Carie Stock who is pleased the second annual event was successful. She said different families need different levels of help. “It depends on the ask. For some families a parking pass means the world to them. Others are more expensive,” Stock said, adding social workers refer families to the organization. The event included food, a silent auction and works donated by 100 different Lethbridge area artists who sold their works and donated the proceeds to help families cover the costs of cancer treatment including drugs not covered by Alberta Health, parking passes, time away from work and support. 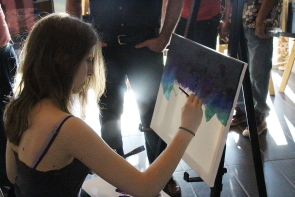 There was also live art being created by Kaitlyn Villlenuve, singers, dancers and guest speaker Alyssa Fraser, who delivered a heartfelt speech about being diagnosed with a rare hip cancer called pseudomyogenic hemangioendothelioma and the resulting expenses her family incurred to get her treatment. Fraser, who is also a competitive weight lifter is also an artist. One of her works brought in over a thousand dollars in a live auction. “We had a performance by Gymfinity Aerials. They were really great. So people came out and supported a good cause, but they also got to see some really cool entertainme nt,” Stock continued, adding 147 people attended the event. Local artists are helping local families help battle cancer with the second annual art show at the Galt Museum, May 27. 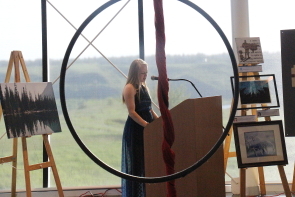 Childhood cancer survivor Carie Stock started the organization “Helping Families,” eight years ago, holding several events including a Calgary Helping Families Art show, eight years ago and decided to bring the event to Lethbridge last year. “I’m a childhood cancer survivor and I remember how hard it was for my mom when I was fighting cancer,” Stock said, noting the money raised goes to families to help cover things like parking fees, ambulance fees, utilities, medication and time spent away from jobs to care for a child for cancer. “Alberta health care covers a lot, but it doesn’t cover specialty expenses,” she said, adding that is where Helping Families is able to help out. “We’ve been doing the event for the past eight years in Calgary and it has been so successful, we decided to bring it to Lethbridge,” she continued. 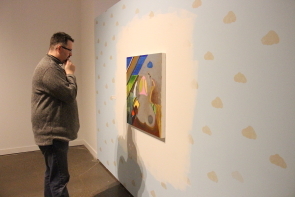 The event will feature works from 100 southern Alberta artists. “They are all from Southern Alberta. One is from Magrath. Most of them are paintings, acrylic and oil and photographs, because those are the best for an event like this,” she said. “This year will be a milestone for us. We’ll have raised $500,000. So we’re excited about reaching that goal. Now we can focus on the next goal which is $1 million,” she said. Local quilters show their talents and passion for sewing, and quilting, June 2-3 at the Val Matteotti Gym at Lethbridge college as the The Lethbridge Centennial Quilters Guild present the fourth biannual Festival of Quilts. “There are 203 quilts in this year‘s festival,” observed quilt show publicist Teresa Petriw, observing the participants were allowed to submit up to four quilts each for the show, which runs 10 a.m.- 8 p.m., Friday, June 2 and 10 a.m. to 5 p.m., Saturday, June 3. She noted all of them were created in the two years since the last show — the Quilting Canada show in 2015. Contributions come from all over Alberta and B.C. as well as quite a few from the 60 some Centennial Quilt’s Guild members. A lot of the members gave away quilts to friends and family which they borrowed back for this show.  “We had a quilting bee to give 1,000 quilts to the Ronald McDonald House. It‘s a busy, active group,” observed Quilt Show Chairperson Trudy Walker. 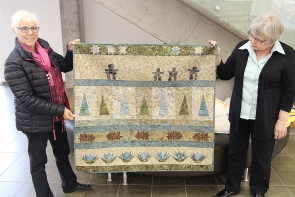 The Lethbridge Centennial Quilter‘s Guild formed in the spring of 1984 when a group of Lethbridge quilters joined together to make a quilt commemorating Lethbridge's Centennial. 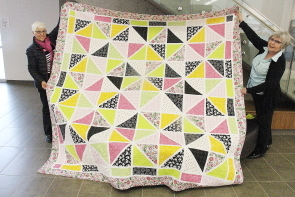 The enthusiasm generated by this project led to the formation of the Lethbridge Centennial Quilter's Guild in 1985. Since then the guild meets monthly to share individual expertise and promoting quilting. The guild presently has 136 members. The quilts in this year’s show aren’t your grandma’s quilts, though some of them include family heirlooms. “I’ve got four quilts in the show. One of them includes lace doilies my grandmother made,” Walker said. “One of them is a challenging group line quilt for which each member added a row to it,” she continued. “It’s really a great an opportunity for people to see these works and for anybody who enjoys fibre art,” Pettriw, noting the quilts weren’t juried, so anybody who wanted to participate was welcome to contribute a quilt or four. “These are all modern quilts,” Walker added. Some of the highlights of the event are two quilts which will be raffled off. There will also be a “Bed Turning,” where the quilters will tell the stories behind their quilts. “There are 18 quilts in the bed turning. As each quilt is revealed, the quilters will tell their stories. Two new exhibits at Casa explore the concept of space usage. Kelsey Stephenson’s exhibit Divining and Mandy Espezel’s “Pine Cones in Soft Mouths” opened on the weekend and run in the Casa gallery until April 15. “Kelsey Stephenson is a local artist who just graduated with an MA in Fine Arts from the university of Tennessee,” said Casa curator Darcy Logan. She explored the idea of topographical maps painted on dozens of sheets of Japanese mulberry paper. “It combines print and painting to evoke topographical maps reflection of geological impact of erosion,” Logan said, observing she used a map of the Drumheller badlands as the base for her exhibit. The individual frames move as the viewer move pst them enhanced by a spooky soundtrack composed by Alex Gray which plays in the gallery. “They are actual topographical maps of Drumheller badlands, but they are supposed to be altered to look like aerial photographs. The badlands were her inspiration,” logan said, adding she worked off actual maps and created the works on Japanese mulberry paper, which is the toughest paper produced, the the movement won’t harm it.